Over the last several years, I've become fascinated by the Apollo space program, which landed six missions on the moon during the late 1960s and early '70s. There are plenty of fascinating books on the subject, particularly Andrew Chaikin's A Man on the Moon and Charles Murray's Apollo. Apollo has also inspired wonderful movies like The Right Stuff and the excellent miniseries From the Earth to the Moon. I'm certain that Charles Farmer (Billy Bob Thornton) would be familiar with all of these resources and pretty much anything created about spaceflight. Schooled by the Air Force and trained to be an astronaut, he quit following his father's death and never returned. The bank is preparing to foreclose on his farm, but Farmer remains focused on a more ambitious goal than paying the bills: he plans to fly a rocket from his barn into space. Even when you consider his high-level science degrees and professional credentials, this seems like an impossible goal. However, his focus remains on finally achieving this idealistic fantasy. 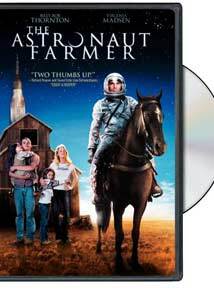 The Astronaut Farmer comes from Michael and Mark Polish, who also depicted small-town dreamers in their last picture, Northfork. Their characters might be delusional but seem resigned to make the attempt or die trying. This type also appears in Jackpot, where Jon Gries' unfortunate karaoke singer still believes he'll become a star. The Polish brothers' films have an inexplicable charm that reveals optimism mixed with an understanding of life's harsh realities. This is their most commercial project yet and could easily be dismissed by cynics as ridiculous fantasy. A plot description could induce eye-rolling in many viewers, which might explain the modest box-office returns. The final product is actually a bit more complex, which is largely due to devoted work from star Billy Bob Thornton. He inhabits Farmer with such believable force that you can forgive some of the obvious messages. The sad determination of this idealistic dreamer compels you to hope for his success. The story largely works due to Farmer's interactions with his family and the colorful townspeople. Played strongly by Virginia Madsen, his wife Audie stays committed to her husband's obsession, but her faith goes only so far. His son Shepard (Max Thieriot) will be "Mission Control" for his planned flight, and he idolizes Farmer. Michael and Mark Polish's own daughters play the couple's young girls, who can't get enough of their fun dad. The interactions might be cheesy but stay real due to solid writing and performances. In supporting roles, Bruce Dern brings his grizzled presence to Audie's father, while J.K. Simmons plays the condescending FAA representative. Bruce Willis has an uncredited appearance as a former astronaut buddy who can't even side with Farmer's goals. The cast also includes brief, colorful performances from Jon Gries and Mark Polish as goofy FBI agents and Richard Edson as a local policeman. This impressive group of actors enhances the straightforward tale and even makes some awkward moments enjoyable. The Astronaut Farmer has a premise that any Apollo enthusiast would love, but it does stumble a bit along the way. One major action happens so quickly that it takes a little while to realize it's not a dream sequence. This event's aftermath slows the pace and fails to match the success of the first hour. The casual early tone and Thornton's amiable presence make the opening acts entertaining, and it's hard to expect this high level throughout the film. A minor rebound does occur near the end, but it still feels a bit too conventional for the Polish brothers. I can appreciate a happy ending, but would have hoped for something a bit more thoughtful. M. David Mullen (Big Love) does provide some wonderful photography throughout the picture, and his final shots don't disappoint. The open landscapes of Santa Fe stand in for Texas, and we see the mythic natural landscape reminiscent of Sam Shepard's place in The Right Stuff. This film does not reach the epic heights of that classic, but it offers an interesting human story. Working inside a conventional plot structure, Thornton and the Polish brothers deliver an engaging portrait of American idealism. Image Transfer Review: The Astronaut Farmer includes gorgeous footage of the New Mexico landscape that recalls the idealistic myths of the Old West. This DVD release offers both a stunning 2.35:1 anamorphic widescreen transfer and a less-inspiring full-frame version. I would highly recommend the first choice, which allows the Polish Brothers' impressive long shots to shine. The colors are much sharper and help to deliver a top-notch presentation. I've seen worse pan-and-scan transfers than this one, but it still lessens the effect of the home viewing. Audio Transfer Review: This disc provides a solid 5.1-channel Dolby Digital transfer that effectively presents the booming sounds of Charles Farmer's rockets. It also includes plenty of background music designed to generate an emotional response. There is nothing particularly wrong with this track, but it fails to deliver the truly memorable sound needed for a higher recommendation. It lacks the power of the best audio offerings but still provides a good experience. Extras Review: The Astronaut Farmer offers countless possibilities to give an interesting history of the space program and the Polish brothers' reasons for exploring this topic. A commentary would have given them a chance to offer lots of good details. Instead, we get an okay documentary, How to Build a Rocket: The Making of the Astronaut Farmer. This half-hour feature does briefly discuss their inspirations and the film's primary elements. We hear from many of the actors about their experiences, and they obviously have plenty of praise for the Polish brothers. The straightforward piece also includes text quotes from astronauts like John Glenn and Christa McAuliffe about their experiences. Other segments present second-unit shooting and a look at composing the score. While the material sometimes borders on being too upbeat, this documentary offers some worthy insights. The remaining extras include a collection of bloopers and outtakes plus a brief interview with astronaut Dave Scott. Running for about nine minutes, the collection of goofs involves the typical missed lines, laughing, and other silly moments. We also see set malfunctions like locked doors and the brick not shattering the window. Virginia Madsen makes a lot of mistakes, and Billy Bob is his usual witty self. I was disappointed that the interview with Scott lasted for only three minutes. He was the commander of the Apollo 15 voyage to the moon and also flew on two other space flights. During this brief feature, he discusses his past and talks about the film's fantasy aspects. Scott as also appeared on similar DVD features, and he's a positive, informative guy. The Astronaut Farmer tackles a technically daring achievement but doesn't waste time showing how Charles Farmer builds the rocket. Instead, we see the personal obstacles that could keep his dream from becoming a reality. Anchored by a strong performance from Billy Bob Thornton, this eccentric picture is sometimes too obvious, but its heart is in the right place. This DVD release could have used more Apollo history and a commentary, but it still deserves a modest recommendation.